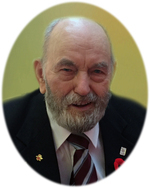 Henry J. Michalski passed away Monday, April 9, 2018, in the Vets Unit at Wascana Rehabilitation Centre at the age of 96 years. Henry was born in the Killaly district on March 3, 1922, to Joseph and Anna Michalski, the second youngest of a large family. Henry served in the Canadian Army from November 1942 until April 9, 1945, in several locations in Canada and at Aldershot, England. After his discharge from the army, he became a farmer, and from 1959 until 1987, he served as postmaster in Grayson. Henry was very active in the community. He played ball with the Grayson Giants, curled, golfed, sang in the choir at St. Mary’s church, coached ball and hockey, and served on several other organizations. Henry married Evelyn Desrosiers in June 1947. Six children were born to this union and grew up in the Grayson community – Edward, Betty, Henry Jr., Marina, Verna and Glenda. Evelyn passed away in January 1975. In July 1977, Henry and Shirley were married and spent 31 years on the farm at Grayson prior to moving to Regina. Henry was predeceased by his parents, all his siblings and their spouses, his first wife, Evelyn, infant great-grandson and Shirley’s son and a granddaughter-in-law. He is survived by his wife, Shirley; children Ed (Linda), Betty (Denis), Henry Jr. (Judy), Marina (Ian), Verna (Jim) and Glenda(Dave); 12 grandchildren and 2 great-granddaughters. Funeral service will be held at St. Mary’s R.C. Church in Grayson on Friday, April 13, 2018, at 11:00 a.m. Burial to follow in the parish cemetery.